All the controls you need to build on every platform. 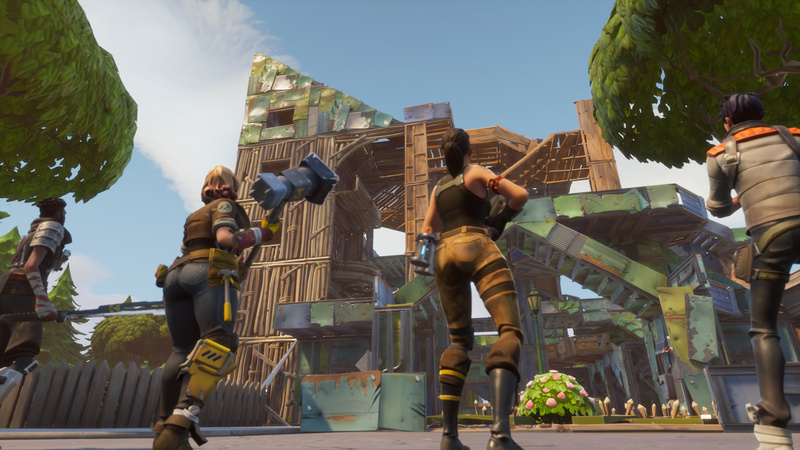 Our Fortnite: Battle Royale How to build quickly page contains everything you need to know about fast base building on PC, PS4 and Xbox One. Fortnite’s spin on the battle royale genre is the ability to build on the fly and use whatever you’ve created to survive. This opens up a world of possibilities when you’re facing an enemy and it often becomes a battle of building prowess over gun play. It’s the player who can create an environmental advantage the quickest or come up with creative ways to destroy their enemy’s setup. Aiming and shooting are key components of taking out enemies, but putting yourself in a good position to win the duel is even more important. Building’s far from easy to get to grips with, so we’ve put together a simple guide that’ll clearly outline all the controls on whatever platform you’ve got Fortnite: Battle Royale installed on. For the complete control scheme, here's our controls for PC, PS4 and Xbox One guide! Editor's Note: We've added in some tips to help you build that little bit faster. You'll find them just below the keybinds section! Q: Brings you to the building menu instantly and defaults to build walls. F5: You can place traps on almost any flat surface. RMB: When you’re in the building menu, simply right click to cycle through which material you’re using. G: Press this to edit an existing structure. You can add doors, create ledges and more. We'd recommend rebinding your control scheme to make your building much faster. It's worth making sure your general mouse sensitivity is set up just right. If it's set too low, you'll find it much harder to swing around in a circle and build around yourself in a hurry. You want a nice balance between speed and accuracy, so take some time to find a setting you're comfortable with and it can do wonders for your building. Practice, practice, practice. Forget about winning matches, and focus on improving your building skill. Everytime you spot an enemy or if you're being attacked, try and get into the habit of building to gain an advantage or to protect yourself. The more you build, the better you'll get! While the mouse button setup can be one of the most difficult to get used to, it's easily one of the fastest ways to build. Your fingers won't have to leave the comfort of your mouse and travel across the keyboard everytime you want to place a ramp, platform or wall. Naturally this means you can pull off some lightning fast builds! [Circle]: Toggles the building menu. Hold [Circle]: Hold circle to edit a structure. [Triangle]: Press this to cycle through the building menu. [Square]: Tap this to pick a trap, tap and hold to interact, or just hold it to jump to your trap inventory. [L2]: Equip your targeted building piece. [Right Stick]: Reset your building edit. [B]: Toggles the building menu. Hold [B]: Hold circle to edit a structure. [Y]: Press this to cycle through the building menu. [X]: Tap this to pick a trap, tap and hold to interact, or just hold it to jump to your trap inventory. [LT]: Equip your targeted building piece. This is an optional control option for both PS4 and Xbox One which changes the control scheme from default to something a little different. Building on console's far trickier than on PC, and many players swear by the Combat Pro settings for faster building as it allows you to easily swap weapons and select building pieces. Although it takes time to get used to these settings, it's worth giving it a go and seeing if it improves your building speed on console!